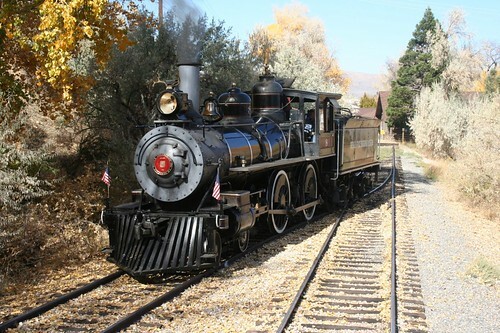 The Nevada State Railroad Museum in Carson City will run the historic steam train over the Thanksgiving weekend. Avoid the crowds and chaos of post-Thanksgiving shopping and take an old-fashioned ride aboard historic Virginia & Truckee Railroad equipment on Friday, Nov. 23 and Saturday, Nov. 24. Fares are $5.00 for adults, $4.00 for seniors 65 and up, $3.00 for kids 6 to 11, and children 5 and under ride free. Trains run every 40 minutes from 10:00 a.m. – 4:00 p.m. The Nevada State Railroad Museum is also an official drop-off location for Toys for Tots. The museum encourages visitors to bring a new, unwrapped toy to donate during the Thanksgiving weekend to show their generosity this holiday season. The Nevada State Railroad Museum in Carson City will remain an official drop-off site for the Toys for Tots program through December 20, 2007. While at the museum, also enjoy the operating HO-scale model railroad that features trains of the Southern Pacific, Virginia & Truckee, Union Pacific and Western Pacific. The Nevada State Railroad Museum operates steam-ups with historic Virginia & Truckee Railroad equipment on select weekends throughout the year. The museum also participates in scholarly efforts, such as the annual Nevada Railroad History Symposium held in Carson City each fall. Open daily from 8:30 p.m. to 4:30 p.m., the museum is located on Route 395 at the south end of Carson City at the intersection of Fairview Avenue. A yellow train station and red water tank at the entrance to the museum grounds are landmarks. For more information, please call 775-687-6953.